The Crow Pillars were created for an installation at the Evergreen Museum and Library, Johns Hopkins University, as part of Crossing the Line: The Art of Rosemary Feit Covey. This retrospective exhibition included the pillars, engravings, paintings and installation components. 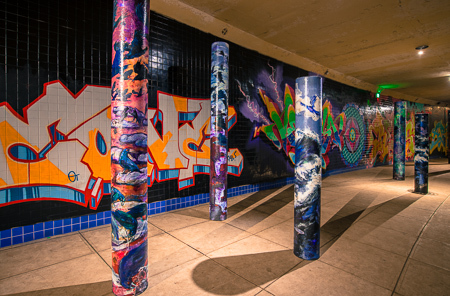 The pillars tell the story of the artist's cross country journey. They were started during a residency at Spiro Arts in Park City, Utah on the site of the Sundance Film Festival and completed at the Torpedo Factory Art Center in Alexandria, Virginia.